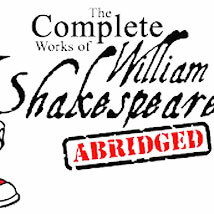 The Broken Arrow Community Playhouse presents “The Complete Works of William Shakespeare Abridged” by Adam Long, Daniel Singer and Jess Winfield. An irreverent, fast-paced romp through the Bard’s plays, “The Complete Works of William Shakespeare (Abridged)” was London’s longest-running comedy, clocking nine years in the city’s West End. Join these madcap men in tights as they weave their wicked way through all of Shakespeare’s comedies, histories and tragedies in one wild ride that will leave you breathless and helpless with laughter.